The property itself is beautiful. There are a diverse plethora of tropical plants, an ocean view from the hill trail, a bottomless lava tube, a crater, and volunteer created artwork covering the common area and many of the accommodations. The accommodations are all different. Ranging from budget camping to a full house. 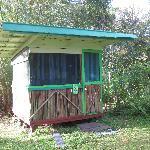 Most of the structures are built from recycled material and/or locally harvested guava and bamboo. My favorite accommodation is the crater hut. 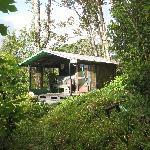 It is one of the most private and scenic locations on the property. What really sets Hedonisia apart is the community of volunteers. People who are staying a while may volunteer in exchange for a discounted rate. At any given time at least half of guests are staying as volunteers. Hedonisia attracts interesting and amazing people from all over the world. Most of them are young, friendly, and adventurous. The owner takes an active part in the community and helps to cultivate a positive environment. Room tip: The Crater hut is the best. I came to Hedonisia planning to just stay for two weeks, but after the first day I knew I was staying as long as I could. I ended up staying there for two months and having the best time of my life. It's one of the cheapest places and you get so much out of it. I met the most amazing people and the vibe was always good. In most hostels people are coming and going every few days so you don't really get to know the people that well, but here a lot of people stay for at least two weeks, so you really get to know eachother and hang out together all the time, so it's ideal for people who are travelling alone. Often times some guest was going to the beach or on a trip and they'd ask who wants to come along and you'd end up going to some amazing spot. The location is breathtakingly beautiful. It's right in the rainforest and you get all the pro's of living in the rainforest without the cons of dangerous animals or poisenous insects. The frogs bothered me the first few nights but after that I didn't even hear them anymore. It also has the perfect balance between being a community that does things together, having communal meals some nights and sometimes all hanging out together and on the other hand also days where everyone just does their own thing and spends some time alone. People always give you your space if you need some, but are down for hanging out too. And the island itself is amazing with all its climates and different terrains. There is something beautiful on every corner and its all very easy to reach since the island isn't that big. Also the area in which Hedonisia is located is not a very touristy area and that helped making me feel right at home. You don't feel so much as an outsider just coming there to visit. All in all, I absolutely LOVED staying here and I would recommend it to anyone! We visited the delightful Pahoa district on Big Island this October and we absolutely loved the setting in the jungle that went completely Alive at night with the sounds of bugs and frogs. The first night was difficult to fall asleep, but not really due to the noise made the nocturnal creatures, but due to the fact that our sheets and pillows stank of sweat left by whoever lay there before us. We get the community is called Hedonisia, but we booked the private cottage so that we could have some privacy and we paid a decent amount of money for that privilege, so we expected at least the basics of the leisure industry. Smelly sheets are a big NO, NO wherever you go. I washed the sheets and the pillow covers myself the next day with my own money - you pay for the use of the washing machine and the dryer $5, the washing up liquid included. However, the stink was also in the actual pillows so they should probably change that for guests. Anyway, moving on from the stinky sheets to the dirty and barely working fridge with little insects crawling inside - your opinion on this? Next, the dusty and unused kitchen utensils that were left exposed to the insect environment - we were washing everything prior to using it just in case. I do not come to the accommodation expecting to clean everything before touching stuff and using it and then paying for it $100. The rooms could have been cleaned more properly too, there were cobwebs everywhere and spiders, especially behind the chairs, sofa, fridge, cupboards etc. It looked as if the place had not been used and cleaned for a long time, which I think is quite unprofessional if you are running this type of a business. 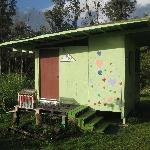 We were told the owner of the community himself sleeps in this cottage when he is in Hawaii, but at the time he was on the mainland, so perhaps he should teach his volunteering "managers" how to look after accommodation prior to a guest's arrival. The positive things are the lovely location and the relative closeness to the Volcano Park and Hilo Beach Parks. We explored the district in detail and it is a good place to stay in. Just hope that the cleanliness will improve. Pahoa has a great natural food store-highly recommend that for tasty, freshly prepared warm and cold foods-buffet style-you will save a fortune this way as Hawaii is expensive. Room tip: If you want privacy, Jungle Cottage is the best, the rest of the rooms are not private completely and you have to share with others the communal rooms such as bathrooms and kitchen, which could use a good regular clean up, too. Unique Gem in a Volcanic Rainforest on the Big Island! I came here knowing NOTHING about the Big Island, and even less about Puna, the area called the "last true wild west." Fortunately I stumbled upon Hedonisia, a funky hostel with down-to-earth owners and a relaxed, homey vibe to it. I volunteer here under their work-trade agreement, and I love it!!! There are SO many papayas and bananas growing here, fresh tropical fruit makes the best breakfast. The barn tents are awesome because the tents are inside the barn, so I'm protected from the elements and close to everything. The long-term volunteers know a lot about the island and are ready to give direction and tips about the best local spots (which are close by and include geothermal hot ponds and hidden tidepools with great snorkeling), and they're quick to hang out and even go with you on a trip to the beach. Truly as much of a community as it is a hostel, I came for paradise, and stayed for the people I met! Being new to the island I was scared that it would take a while to adjust, but staying here, I believe, was the best decision I could of made. Before my trip, the managers were very helpful and answered all the questions I had. The website is very useful too, and very true in description to the real deal. The location is beautiful, I was in complete awe the whole time I was there. I stayed in the crater, it's your own personal paradise. My favorite part of the property was the outdoor shower, being able to see the tropical plants and the hearing the calls of the animals was very relaxing. The people who are guests there, and the managers, were friendly, helpful, and I feel as though I gained knowledge from everyone I met. When people had free time, we explored local areas, and we were able to show each other around to the best spots. I am not lying when I say I have never felt more enlightened. Being around great people and great beauty made my move to Hawaii the best it could be. If you are looking for a humble place to stay, I recommend this hostel 100%. I will say, this place is NOT for people looking for fancy resort. I recommend this to adventurous people, looking for a non conventional place to stay, an outdoor lover who only needs the simple things in life to make them happy. During this season, the property was abundant in fruits including pineapple, bananas, avocados, mangos and more. Some advice is to wear lots of bug spray or layers to prevent being attacked by mosquitoes, you are in a rainforest. I also appreciated how much art I was surrounded by, and the fact that so many of the structures are made from recycled materials. The location isn't too far away from beaches and shops, but I recommend a rental car to have more freedom in your travels. I will definitely be coming back to this community. Overall, I wouldn't change a thing. Room tip: I like sleeping in tents when I travel, the crater is the best location for that. Bring earplugs if you are a light sleeper due to the coqui frog calls at night. Eclectic, slightly eccentric, and loads of fun! Hedonisia is not your usual hostel accommodation; no crowded bunk rooms, and right in the middle of a rainforest! It can be a bit noisy at night, but not with any traffic noise - just lots of frog and gecko calls and the odd rustle if a pig wanders through (don't worry there is no danger from them). I thoroughly enjoyed myself, slept very well and departed with the feeling that had I not stayed there I would have missed out on one of the most interesting experiences of my Hawaiian trip. Almost everything is made from recycled materials (most of the kitchen area is made from materials from a Starbucks which went out of business). If you do not have a hire car, there is a bus service to Pahoa (it used to be free but it is now $1) and I am sure you can make arrangements to be picked up from town. Bring a small flashlight as the accommodation cottages/campers do not have electricity (the common area does and the wifi signal is good). The longer you can stay the more you can get into the vibe, and there is a work exchange program which looks to be working really well.